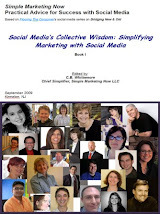 Kinnelon, NJ – Christine B. Whittemore, chief simplifier of Simple Marketing Now LLC, will address social media marketing best practices in two educational sessions during Surfaces 2010, the annual exposition for floor covering professionals. Both the three hour workshop and the one hour seminar offer a practical approach to benefit flooring retailers; they take place at the Sands Convention Center in Las Vegas. Simple Marketing Now is a marketing communications consultancy that provides organizations with the right combination of traditional marketing and social media marketing to improve the customer experience and build brand. Simple Marketing Now issues the Social Flooring Index - http://www.SocialFlooringIndex.com - which monitors the social state of the Flooring Industry.